The Rukka 4Air Pants, part of Rukka's Spring 2017 line, are going to be a very familiar option within the Rukka line, taking on many of the key features previously seen on the AirMan Pants. Constructed from rugged Cordura AFT, these pants allow a ton of airflow and have great abrasion resistance. 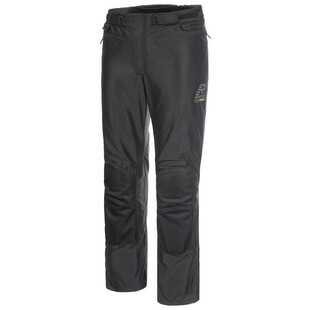 The 4Air pants also include the massive Rukka D3O Air knee and hip armor, which we have come to love and expect. Not only will these pants keep you dry with their detachable waterproof Gore-Tex liner, but Rukka’s Outlast phase-change material will also guarantee that you are the perfect temperature just about all year round. Overall, the Rukka 4Air Pants would be the perfect option for the rider looking for a comfortable and protective riding pant to get through almost any riding condition.